French politics have been shaken as their traditional political parties (socialists and Gaullists) had to pick themselves up from a very tight race. For the first time since 1958, the Socialist and Gaullist parties are both out of the second round of presidential elections. 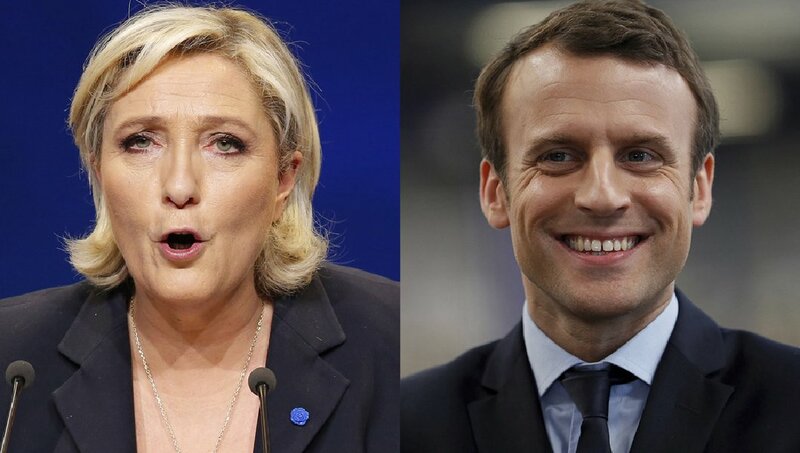 Centrist Emmanuel Macron and far-right leader Marine Le Pen have moved to the second round in the French elections, which will take place on May 7th. With a turnout of 79%, Mr. Macron won 23.8% of votes, while Ms. Le Pen took 21.5%. This result is lower for Ms. Le Pen, as she was expected to take 23% of the vote, according to Sofres One point Kantar (announced by Le Figaro). 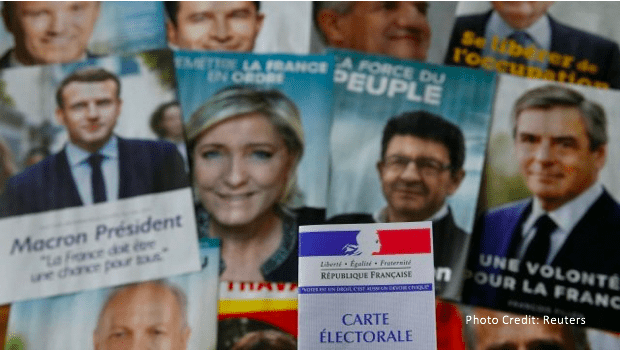 Nearly 47 million French people went to the polls on Sunday for the first round of the presidential election. These are the most unpredictable outcome elections in recent history in France, with a very heated dispute among four of the 11 candidates. The protagonists were centrist Emmanuel Macron and extreme right-wing leader Marine Le Pen. 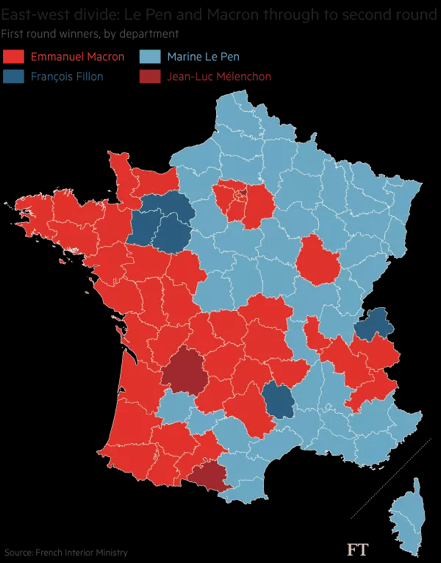 Both led opinion polls published on Friday, and made French all around greet their teeth and anguish. However, conservative François Fillon and radical left candidate Jean-Luc Mélenchon also held a close race, taking 19.9% and 19.6% of the votes respectively. Following the first set of results, socialists Benoît Hamon and François Fillon gracefully accepted their defeat, and declared their support for Macron. The first round of the French Presidential elections underpins the French discontent and yearning for change, as yesterday’s results represents a setback for the traditional parties that have alternated in power for decades: the Socialist, led by former President François Hollande, and the Conservatives, led by François Fillon. Either one of the two candidates will make French history: Macron as the youngest president in French history and Le Pen as the first female head of state in the country. A Macron win would be a relief for the European Union (EU). Macron, former Socialist President Francois Hollande’s economy minister, held an open pro-European and liberal agenda. Yet, if a win is secured by Ms. Le Pen, she will tether both Brussels and France as there would be a period of great uncertainty for the EU due her promulgation of leaving the euro zone, giving a fatal blow to a bloc already weakened by senseless Brexit. It is unavoidable to draw a certain degree of similarity between Ms. Le Pen ultra-right movement campaign and the arguments that made Donald Trump president of the United States. Once again, we see how a campaign cantered on “patriotism” and ” national preference” rallies in a western country. Polls conducted before Sunday’s election gave Macron a second round win on May 7 against Le Pen (Ipsos/Sopra). Yet we shouldn’t rely on opinion polls, as recent events have taught us. Had they been correct we would have a Bremain and the first women as president in American History. The case for Le Pen stands close: she has gathered 7.6 million votes, 2.8 million votes more than her father and the strongest result ever for a FN candidate. Her ideological battles have resonated among French citizens, elucidating herself as a patriot and independent politician who will not be “Hollande´s baby”. While we have political rivalry on one side, we cannot ignore the situation in which this is taking place. One cannot help but admire the French people this weekend. 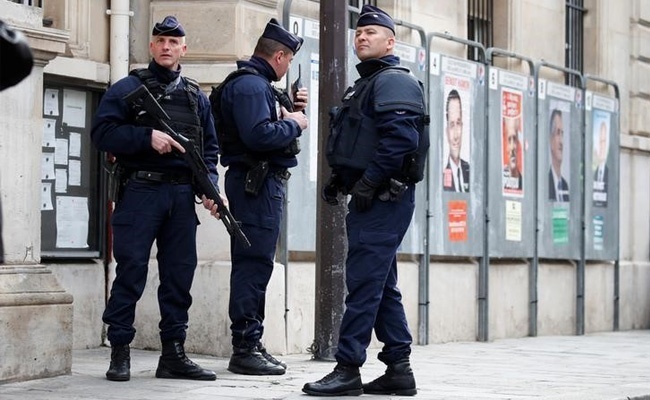 Despite the threat of extremist attacks on these elections, the French were not frightened nor intimidated by the so-called Islamic state and its affiliates. In 2015, France saw its worse attack when a series of organised attacks led by the so-called Islamic state left 230 dead. One of the worst tragedies, this has not broken the French spirit, a led to the surge of the “You will not have my hate” movement, led by widowed father, Antoine Leiris. The final stretch of the campaign was shaken a day before the elections by an attack on the iconic Champs Elysées in Paris and the arrest of extremists who had planned an imminent attack. Amid tensions and recent wounds, citizens flocked to the polls, and participation was one of the highest in the last 40 years. Authorities did not spare in terms of security throughout the territory, sending more than 50,000 police and gendarmes, which had the help of 7,000 soldiers. Domestically, these elections are crucial in a country that slumped in the 2008 Euro Crisis and have not been able to get on their feet. With an economy hit by unemployment, and growth rates stalled, the race to the Élysée Palace was atypical. Unpopular as one can get, Hollande was forced to resign from running again, a rare moment never seen in the past 60 years. Its prime minister, Manuel Valls, was defeated by Benoît Hamon, who ironically was the biggest loser in this presidential round. Legal problems from several candidates have also stained these elections, which shunned away debate from issues that truly mattered. François Fillon lost his title of “France’s sweetheart” after the press revealed that his wife, Penelope, and two of his five children benefited from supposedly fictitious public jobs, for which they received hundreds of thousands of euros. Appearing for misappropriation of public resources and misappropriation of social assets, Fillon, who claims innocence, did not relinquish his candidacy. Marine Le Pen is also the subject of an investigation into alleged fictitious jobs in the European Parliament, where she occupies a chair, as alleged irregularities in the funding of past campaigns have come to light. Adding to the mystery is her refusal to be questioned by the justice system, invoking her right to parliamentary immunity. The last delight came from the radical left. Mélenchon, a former socialist who turned the party symbol “France Insubmisse”, rose in polls with a combative speech against what he considers “the caste” policy. This admirer of Venezuelan Hugo Chavez and Cuban Fidel Castro was willing to ignore the EU if he did not end the austerity policy. Macron and Le Pen will now have 15 days to convince the 47 million voters that they are the best choice to run the country. We can expect petty internal wars, as dirt under the rug can only last for so long. The winner will then have to create alliances, amid the upcoming June legislative elections, which had so far favoured the traditional parties. This will prove a struggle to any of the candidates. More importantly, the winner will define the route for the EU, and we cannot help but hope it is not the one whose agenda is filled by discrimination and hate. Less than 48 hours after the results of the elections, Marie Le Pen has stepped down from the leadership of the National Front (FN. However, this is only temporarily. A move that appears to be tactical and symbolic, this is a way for Ms. Le Pen to embrace a broader spectrum of potential voters ahead of the elections pitting against Mr. Macron, as well as show her empathy towards the concerns of all French people, not of her party alone. “Tonight, I am no longer the president of the National Front. I am the presidential candidate,” she said on French public television news. This is not the first time that the former FN leader has set herself apart from her party. In February, she made it clear that the measures she would champion were hers and not her party’s.